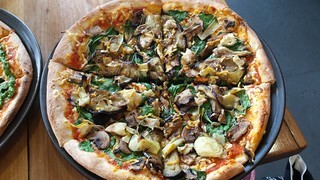 I've eaten at Vegerama's West End restaurant a few times, but today I am going to do a little pizza round up. I actually think the pizzas are probably one of the best things on the menu, although I wouldn't mind if they went a little easier on the Daiya. 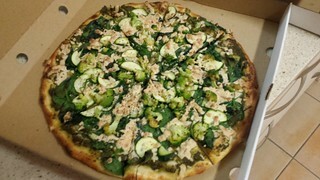 The day following my last post, Elizabeth and I hit up Vegerama to share some pizzas. 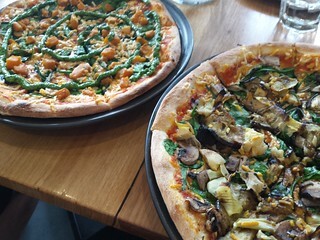 This was the first time I'd had pizza there, and it was amazing!We had a lovely Roast Pumpkin Pizza, that also had spinach and a pesto swirl, as well as the Roast Artichoke Pizza, which also had eggplant and mushrooms. Another time I went for dinner after work to meet up with an Instagram friend who was visiting from The Netherlands. We both got pizzas. She got he Supreme, which I foolishly did not photograph. But I got the Four Corners. 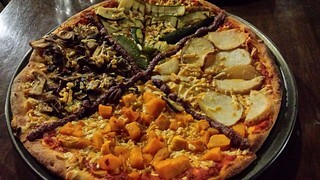 The pizza is divided into four sections with different toppings, and a border of olive tapanade between them. One of the quarters was meant to be capsicum, but I had them sub it out for me. My quarters were potato, pumpkin, zucchini and mushroom. The above three pizzas were delicious, but they are no longer on the menu any more, as they change their options every now and then. I have had a couple of pizzas off the new menu. I got them to take away one evening, so they were a little cool by the time I got them home. But still yummy. One of the pizzas was a Margherita pizza, but the photo of it was so blurry. 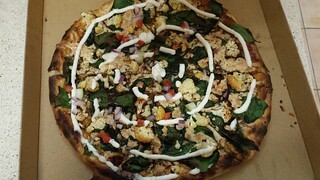 I figure you all know what a margherita pizza looks like, though. First up is the Brassica, which had spinach, cauliflower, paprika, cheese, aioli and a fresh sprinkle of cucumber, tomato and onion on top. It was a nice, fresh tasting pizza. 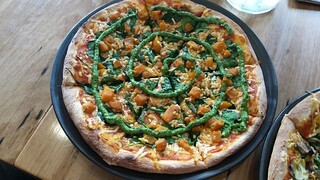 The other one was the Verde pizza. I see that they have recently changed their menu AGAIN! And this doesn't seem to be on it anymore. Anyway, as the name suggests it was very green, with spinach, broccoli and zucchini. It was meant to have green capsicum, but I had them leave it off. Sorry, this photo is a little blurry. 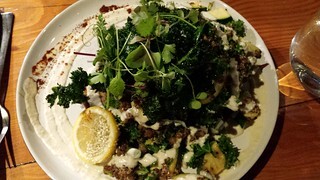 I think many people I know would agree that a pizza is probably the best bet at Vegerama, they are consistently good where as other menu dishes are hit and miss (and yet I continue to try them, the last ones I had were a big miss... more on that later). And really, pizza is the best so everyone wins! 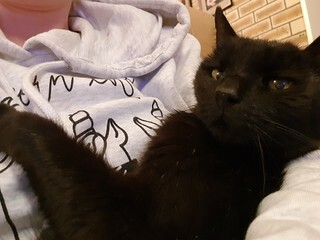 My baby girl in my arms. She actually spent most of the time that I was writing this post sitting on my lap, except for the times I had to go and check on something in the kitchen, when I would scoop her up and carry her with me, before we returned to the computer. Such a sweetie. At the end of last year, my friend Elizabeth was up for the Animal Activist Forum. After it was over, we spent some time eating some food! At the end of the final day, we went for dinner at the Greenhouse Canteen & Bar. I had eaten at their previous location before, but they had since moved (a little closer to Brisbane, handily) and I had heard good things. So off we went! We started with a shared plate of Stuffed Zucchini Flowers, which had almond feta, basil and hummus in them. 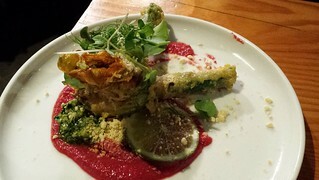 I haven't had many stuffed zucchini flowers before, and these were very nice and delicate, though at one per person they were a very light start to the meal! 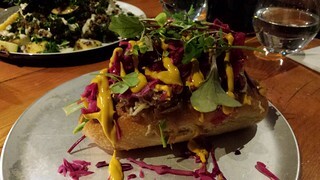 I couldn't go past the Adzuki Bean Gourmet Hotdawg - a homemade adzuki bean sausage in a bun topped with caramelised onions, sauerkraut, slaw and mustard. The sausage on its own was kind of mushy, but all together it worked really well and was very tasty. Just kind of small for a main meal (if only it came with a side!). Elizabeth had the Savoury Socca, a chickpea pancake topped with lots of vegetables and sauces (sorry, I can't quite remember and the menu has changed since then). It was very large, though she remarked that the pancake was a bit sludgy and the flavour wasn't all there. Still kind of peckish after our food, we decided to order the Antipasto Platter, which was an excellent decision! Nut cheeses, dips, crackers, pickles, antipasto and fruit, it was an amazing end to the meal and so much fun to work out way through all the different options! Unfortunately they were all out of baked desserts, and only had coconut oil heavy raw desserts in the cabinet, so I had to skip dessert. 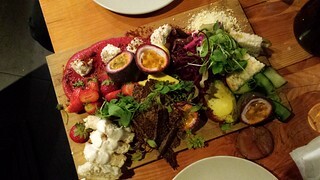 The Greenhouse menu changes seasonally, as well as specials, so I would definitely like to check it out again sometime. They also have a small section where they sell cute vegan clothes and accessories! It's Aurora again! 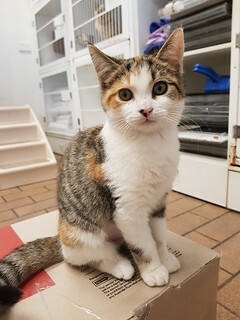 Can you believe that this adorable doof hasn't found a home yet? If you are in Brisbane and want to meet her, let me know! 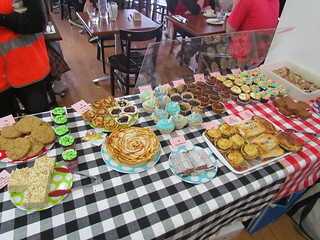 At the end of July I organised another bake sale for Animal Liberation Queensland at The Green Edge. It was a huge sale - we sold out within about two hours, and we raised over $1000! It was so great! But let's stop and see what the food was like? I made my regular Berry Patch Brownies, but I also made several new to me things, as is my habit. Living on the edge! Orange Pudding Cupcakes from Vegan Cupcakes Take Over The World by Isa Chandra Moskowitz and Terry Hope Romero. As you'll see below, we were having some fancy cupcakes donated, so I decided to try and make a filled cupcake (I can't compete with the fancy icing styles). 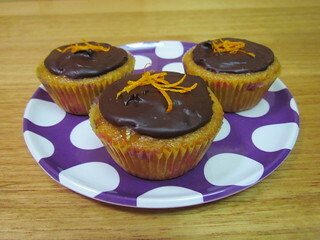 This is an orange scented cupcake, filled with orange pudding and topped with orange marmalade and then chocolate ganache. They were so good! The pudding went very, very thick, and ended up making about twice as much as I could fit in the cupcakes. But it was yummy, so you get left over pudding to eat. These were so great! The only thing I would change is adding a bit of orange extract to the ganache next time, as it is quite thick and I think I would like it better to tie into the orange theme. I didn't get an inside shot, but these had a goodly amount of pudding in the middle! Venus Chocolate-Pumpkin Muffins from Bake and Destroy by Natalie Slater. These are named after Venus, the internet famous kitty with a half orange and half black face. 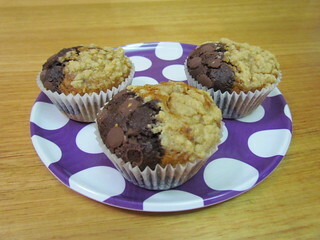 In her honour, these muffins are half pumpkin and half chocolate. On eating, the pumpkin side is a bit gooey and the chocolate side is quite dense, in fact the chocolate batter was a lot thicker by comparison (and made a little bit left). This says it makes 10-11 muffins, I got 11 and 2/3 using decent sized muffin liners. The chocolate side is topped with chocolate chips, and the pumpkin side with a generous amount of strusel. 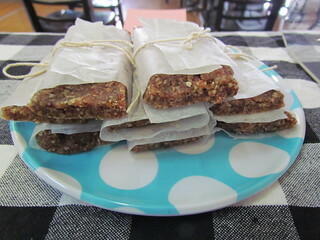 Spiced Sweet Potato Blondies from Vegan Cookies Invade Your Cookie Jar by Isa Chandra Moskowitz and Terry Hope Romero. These blondies are sweet with a subtle spice to them, using a mix of cinnamon,ginger and allspice in the sweet potato based batter. They have chopped walnuts in them, though I left out the optional chocolate chips. They are very dense and moist, kind of like a slice of sweet potato pie filling! Cranberry Walnut Oat Bars from Eat Like You Give A Damn by Michelle Schwegmann and Josh Hooten. These were a last minute addition, given then they take only a few minutes to make. Dates, nuts, oats and cranberries and blended up in the food processor, and then pushed into shape to set. I pushed mine into a lined 8x8 inch pan to set, rather than shaping them into an 8x8 square on a baking sheet. They firm up quickly, but they are very thin and a bit delicate. Next time if making for a sale I'd push into a 4x8 inch tin to give a thicker and sturdier bar. I'd also consider a brief soak of the dates if they are a bit dry, I had to add a bit of extra water to keep it all together. Seven-Layer Bars from The Vegan Cookie Connoisseur by Kelly Peloza. These seem like they are fiddly, but actually come together super quickly. The base is a crushed graham cracker base, but being in Australia I subbed crushed digestive biscuits. 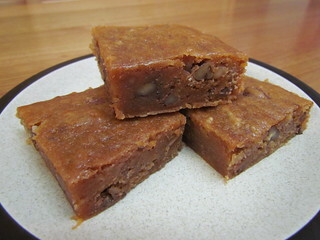 You make an easy coconut caramel, spread it over the base with some chocolate chips and then top with shredded coconut, butterscotch chips and walnuts. The chocolate chips and scattered over the top of the base and topped with the warm caramel, so they kind of just melted into one chocolate caramel layer. You need to press the toppings in sturdily, otherwise the butterscotch chip and walnuts will fall off a bit from the finished product. I needed to bake this an extra 10 minutes in my oven for it to fully set. These were a special treat, and a lot of fun. Gluten Free Chocolate Mint Cupcakes from Vegan Cupcakes Take Over The World by Isa Chandra Moskowitz and Terry Hope Romero. 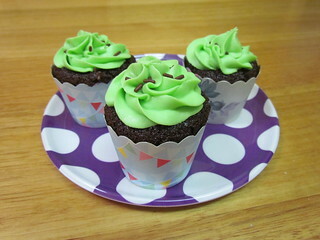 The regular version of these cupcakes uses the basic chocolate cupcake recipe with added mint extract, so it is easy to make then gluten free using the Chocolate Gluten Freedom Cupcake recipe as the base, with added mint extract. The last time I made the mint icing, it was very soft. This time I used only 2 cups of sugar rather than three, resulting in a higher shortening to sugar ration, and it was much better and set up very nicely in the fridge. I sprinkled these with some chocolate sprinkles rather than making a ganache. 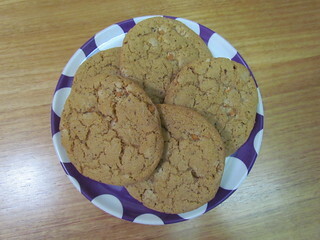 Gluten Free Butterscotch Chip and Almond Cookies based on recipe from Great Gluten Free Vegan Eats by Allyson Kramer. These are the soulhaus cookies from the book, but modified to use butterscotch chips and toasted almond slivers instead of the chocolate chips. These cookies are the best GF cookies I have ever found, and one GF person at the bake sale was overwhelmed to find such a perfectly textured cookie! She was super happy that I was able to point her in the direction of the recipe. If you have GF friends, always make them these. 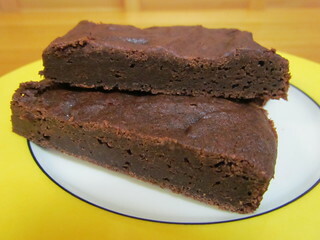 Gluten Free Fudge Brownies from 500 Vegan Recipes by Celine Steen and Joni Marie Newman. Another tasty treat thanks to some sneaky sweet potato puree! Also thanks to a cup of melted chocolate mixed into the batter. These don't rise high, but they are very dense and fudgy. The recipe says to melt the chocolate first and cool it, then add the milk and oil and potato puree. But if you do that the chocolate will start to set again. Melt the chocolate with the milk, and add the other ingredients while still warm, then let it cool a bit. I needed to cook these for an extra 20 minutes in my oven. Orange Cream Crisp Rice Treats from this recipe from the Dandies' website. 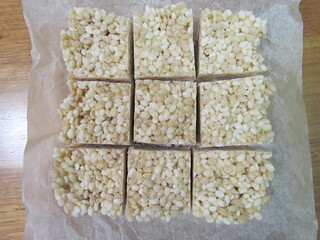 I had a bag of Dandies that needed using up, so rice crispy treats seemed like a good enough thing to do. This recipe calls for a mix of vegan butter and coconut oil. I had some coconut oil kicking around in the cupboard from my pre-death days, so I decided to use some of it up here. As a result, I couldn't really enjoy the finished product because it just tasted like coconut oil to me. I thought the orange taste could have been much stronger as well. Oh well, they were not for me, they were for others, so I hope they enjoyed them. We also had a lot of great baking donations! 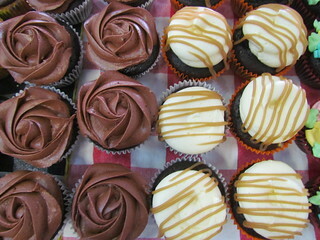 Wonderful Brisbane vegan Katie, who runs Cloverly Cupcakes kindly offered some of her stunning creations. When Katie started Cloverly, she was the first real vegan baked goods distributor in Brisbane! She doesn't bake for shops or stalls anymore, but is still happy to whip our some gorgeous sweets for bake sales. She made a bunch of chocolate cupcakes with three different toppings. 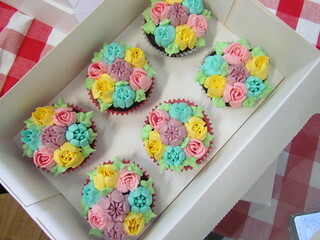 There was chocolate icing, caramel icing, and a stunning coloured vanilla icing using Russian tips. SO FANCY AND PRETTY! 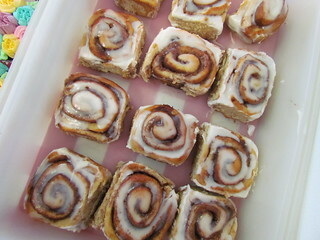 Bec, who is also with ALQ, baked some of her famous cinnamon rolls. 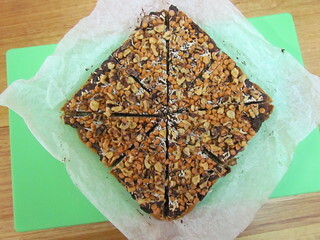 Bec recently spent 6 months studying at the Natural Gourmet Institute in New York, so she has mad skills! Lisa and Paul Foo are powerhouses of the Brisbane animal rights scene, and also make amazing food. 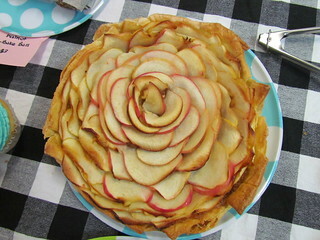 Paul is trained as a chef, and comes up with wonderful creations. 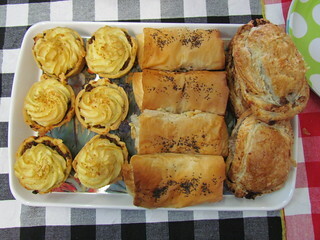 This time they provided our savouries - mini cottage pies, carrot lox and bechamel filo packets, and mushroom pasties. They were all so good. I especially love the filos! 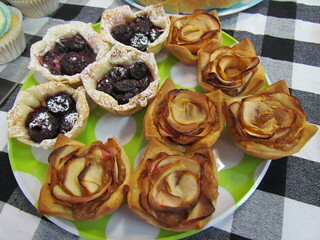 And finally we had some donations from the lovely Daniela, who runs vegan catering business The Borg Chicken and also has recently started providing vegan options for Perks Cafe in Nundah. 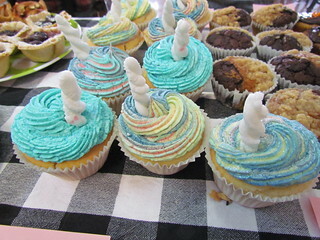 She made some gorgeous unicorn cupcakes, as well as some mini apple and cherry pies, and a large family-sized apple pie. I enjoyed some of her cherry pies when I watched Twin Peaks the next day! Afterwards we all sat down and enjoyed some Green Edge food (more of that in another post). I need to take a little break from organising bake sales, because at the moment it is a bit much, but I am glad this one was able to be so successful! Tomorrow (the 17th) will be six months since Sahara. I don't even know how so much time has passed. I miss her so much. Thankfully Sunday was a slightly shorter day compared to the Saturday. So let's talk about laughable venue food. 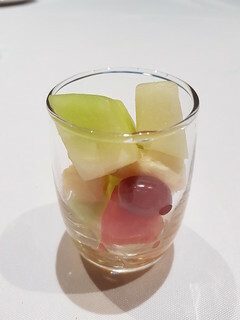 I started off in my hotel eating oats, and then went to the venue for the 'catered vegan breakfast' of tiniest fruit salad ever. In what world do they think this is breakfast for anyone? 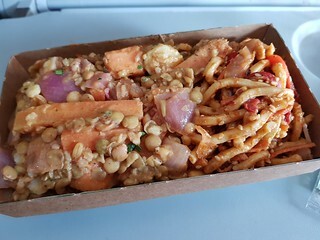 They had three vegan options you could choose for lunch, two of which were the same as last year. The sad, soggy, oily veggie wrap and the tiny serve of rice paper rolls. This time I ordered the veggie gyoza for both days... at least it would be hot, right? Oh, silly Susan. 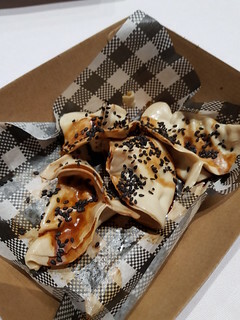 It was lukewarm, dried out gyoza with a drizzle of stuck on sauce and sesame seeds. At least the taste was not offensive. And at least I had packed my noodle cups and snack bars and fruit! Anyway, thankfully I planned ahead and never was hungry throughout the day. And after it was over, I went and met Jess again for some ramen. I love ramen! 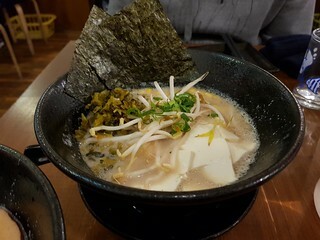 We went to try Mr Ramen San in the city, which had two vegan options. 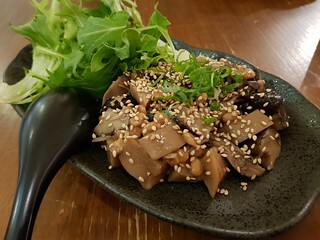 We wanted a little started, and asked if the natto with mushrooms was vegan. Neither of us had tried natto before, but we were both keen. We were told that it was, but they kind of suggested maybe we wouldn't like it, which was funny and only strengthened our resolve! And of course it was fine. Sure, a little bit slimy, but it tasted nice. And it was mixed through with some mushroom chunks. It was good! 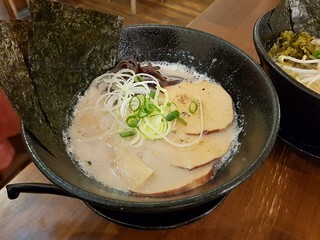 There are two vegetarian ramens, which are vegan without the egg. And we ordered both. 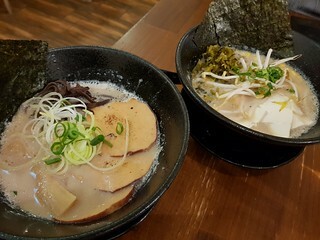 They both have the same broth, but one was a 'charsu' ramen (with vegetarian Roast 'pork', leeks, spring onion, bamboo, Wood ear mushroom and seaweed), and the other is tofu ramen (with tofu, spring onion, beansprout, corn, pickled vegetables and seaweed). We swapped some of the toppings between the bowls so we could try everything. They were hot and tasty! On the way home I got another Soy Matcha Latte from Starbucks, but I got a larger one. Which was yummy, but then made me pee one million times overnight, so I have to remember that for the future! Also of note, they had both vegan Vitasoy Cafe soy milk there, and the non-vegan Vitasoy with Vitamin D, he started making it with that one, so thankfully I saw and stopped him. But double check on the soy milk you get there! Monday morning was a team breakfast at a hotel buffet, which is not a good time for vegans. But it is a nice time for seeing everyone. So I went out for breakfast first and then met everyone there. I went to Lord of the Fries for a Tibetan Burger (tofu egg, vegan cheese, mustard and mayo) with bacon added and a hashbrown. I also stopped by Broad Bean again and got a turmeric latte, and I had a juice left. The burger was OK, but it is certainly no Smith & Deli Egg McMartinez. The bun was very soft and oddly sweet. But still, it was a filling breakfast. We got picked up and taken to the airport, only to be hit with a three hour delay (I hate Jetstar so much). So I walked around, we chatted, and I got some lunch. There are a few options at Melbourne airport, but you would think there would be more. The best options are in the Jetstar terminal, at least. I ended up getting a Mucho Veggie Burrito Bowl from Salsa, which was nice and fresh option. 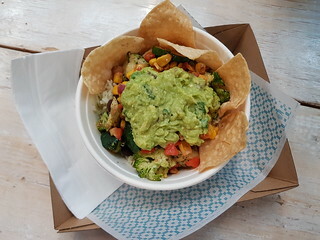 It had lime and coriander rice, zucchini and broccoli, black beans, corn salsa, and guacamole. It is also meant to have onions and capsicum and a chipotle salsa, but I asked for them to be left off. Still had a slightly uncomfortable hit of chilli, though. I also grabbed a sushi roll for a plane snack. 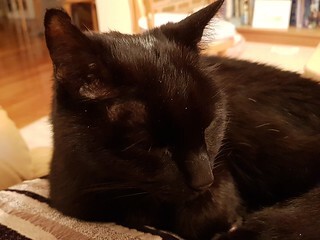 I was pretty exhausted, and glad to be home to my sweet Dim Sim! Speaking of sweet, I picked up some chocolate goodies to bring home with me. 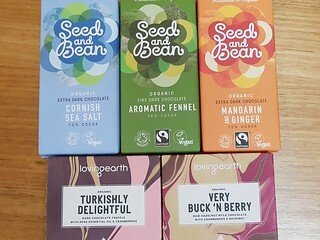 The Loving Earth chocolates were on sale and Broad Bean. They are the only raw chocolate brand that I like, and these flavours are SO GOOD. Especially the berry one. I also stumbled across a little shop that had every single flavour of Seed & Bean! I started piling up all the vegan ones, before reminding myself that they were $8 a black, so I pared it back to three. My favourite sea salt, the mandarin and ginger (which was yummy), and the intriguing fennel (which I am still yet to try). I do have some regrets about not getting Orange & Thyme. As a bonus, all this chocolate is on the Food Empowerment Project Approved Chocolate List, so I can enjoy these without worrying that they were made using child slavery! And finally, let's talk about Alyson Hannigan. Buffy is the show of my heart, my forever show, a love of my life. And Willow is without a doubt the best part of Buffy. 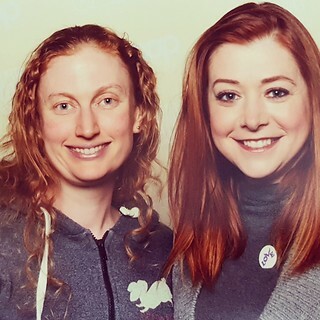 I got to spend a lot of time near Alyson Hannigan while I was looking after Tom, which was lovely. I am pretty awkward, so I liked not having to talk to her a lot because - oh my god - fan girl alert. At the very end of the con, I did manage to babble a brief thank you for being Willow at her, and then she was off so I was able to slink away. Of course I had a photo with her! Behold! You can bet your bottom dollar that I was overjoyed to come home to my perfect little princess. At the end of June, I went back to Melbourne for the second time this year... only four weeks after my first trip! This time it was for OzComicCon, where I work as a guest handler. I was looking after Tom Lenk, and this was very exciting for me because he is from Buffy and Buffy is my most beloved TV show ever. Even more exciting, Alyson Hannigan was also going to be there, so I was going to be able to quietly bask in her glow. But I know you are here for food. So let's talk food. My food game started at the airport, before I even got on the plane. 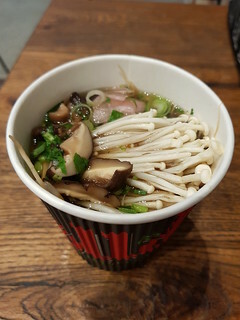 I had some time, and I was hungry, so I stopped into Roll'd and got some of their vegan pho with mushroom and tofu, no chili. It was really yummy! I also got a couple of salads from SumoSalad to take for lunch on the plane. I got a hokkien noodle salad, and a Moroccan lentil salad. They were both tasty, and nice and filling. After landing and getting to my hotel in South Bank (not an area I would ever choose to stay in if I was visiting Melbourne otherwise, as it is a bit far from the good food), I stopped by Broad Bean Organic Grocer to see about picking up some extra supplies. I had already come well equipped with 90 second oat sachets, soy milk poppers, dried fruit, noodle cups, plus all the snack bars in the world. The do have smoothies and hot drinks, and some vegan salads and sandwiches, as well as a range of vegan supplies. I grabbed a few bottles of juice and a kombucha (I drink one bottle over a couple of days and let it go a bit flat first, but my tummy does love the probiotics. I also grabbed a maple peanut butter soy hot chocolate, because how could I not! I had some unexpected free time in the afternoon, and I decided to use it in the best way possible - a trip to Smith & Deli! This is my happy place. It was 4pm when I got there, so a lot of things were already sold, but I was able to pick up a few treats as well as one of their delicious chai lattes. 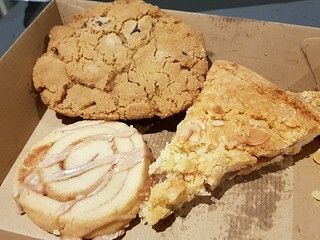 I got a chocolate chip rosemary cookie, a cinnamon roll cookie, and an apple and rhubarb shortbread. Friday night is the cocktail party night, which is long, so I needed to get a decent dinner. Vegie Kitchen (previously Enlightened Cuisine), just a block away from my hotel, was unexpectedly closed during last year's OCC, however this year they were open. 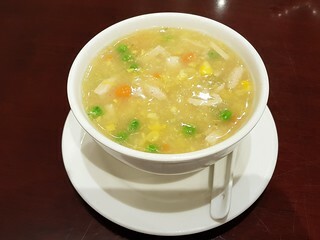 I got a sweet corn soup to start, because I love sweet corn soup! 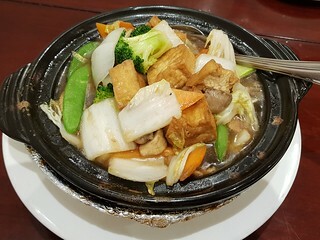 Although they have a large menu of exciting mock meat options, I went for a tofu combination pot (it had a bit of mock something in it too), because I can't say no to giant plates of tofu and veggies. Saturday brought the start of OzComicCon proper. 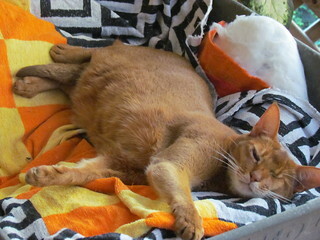 This was a 12 hour day, and it is busy, so there is no chance of getting out for food. 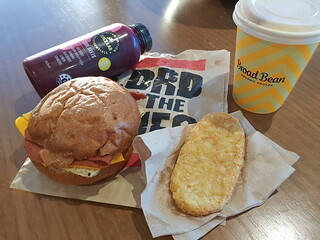 Breakfast and lunch is supplied for guest handlers, but the Melbourne Exhibition and Convention Centre's idea of what is decent catering for vegans is pretty laughable. I will post more on that in my next post. Suffice to say, I was very glad that I had pre-fuelled with oats and a my rhubarb apple shortbread (what, it is fruit, breakfast food! ), and had packed a noodle pot, a banana, a cookie and many snack bars. After I got out, I power-walked (I spent a lot of the day sitting and being around a lot of people, walking in some 'fresh' air seemed perfect) to meet my friend Jess at The Last Chance Rock & Roll Bar for dinner. We met at 8, and even though it was a Saturday night there was almost no one there at that time. The crowd started coming later. Fine by me! 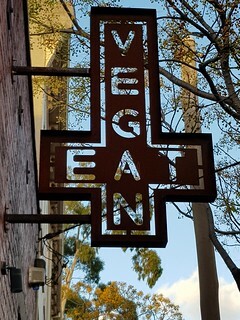 They have a vegan section on the menu, which seemed to be different again from the two versions currently floating around online. Sadly no sign of the vegan smoked croquettes. We ordered a few things to share, as is our usual style. The vegan BBQ braised lamb burger was quite nice. 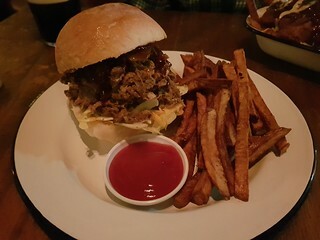 I have no idea what they used for the lamb, it was like a mound of minced or pulled something, but not jackfruit, but it was nice on the burger with some slaw and a pickle. The Vegan Halal Snack Pack was OK. We asked them to put the chili sauce on the side, but turns out they don't use chili sauce in their one. 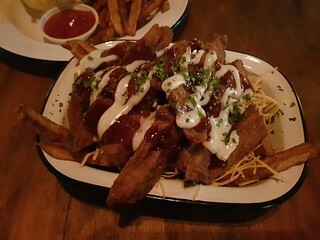 It was chips topped with cheese, mock chicken, BBQ sauce, and hummus, which is a combination I can get behind. The downside was the chips, which weren't great. I would have liked some better chips. 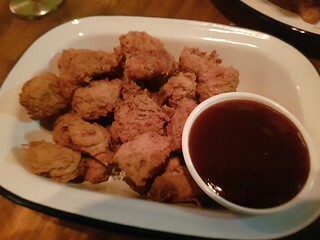 We were still a bit peckish, so got some Popcorn Chicken to share. This was great. It was crispy and not at all oily, and it was hard to stop snacking on it. On the way back to the hotel, I wanted a little sweet and warm ending. So I stopped by Starbucks (of which there are very few in Australia) and got a small soy matcha latte after hearing Jojo's enthusiasm for them. And it was yummy. I'll be back in my next post with the rest of my trip! Remember Aurora from my last post? This is her sweet sister Belle. 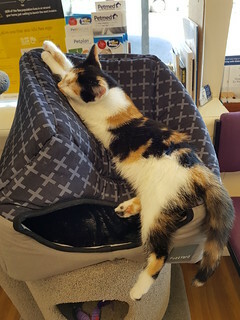 Belle has already got a home!